This well-loved guard probably has many tales to tell, but he’s a true guard of the King, so you’ll never get them out of him. 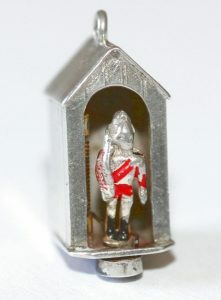 Still, at the press of a lever, our little sterling silver man will pop out of his post and back again. No wonder Alice wants to marry him. Click and view more pictures of this moving charm here.